Robert Burns was a poet, an artist with words. Ken Burns is a documentary film producer, with the great Baseball chronicle earning him high praise. Bob Burns, a 1930’s and 40’s actor and musician from Arkansas, also has had a profound impact on baseball, more specifically on vintage baseball cards. Bob Burns, you see, invented a silly musical instrument from some pieces of pipe and a funnel (yes, he actually played it! ), and called it a Bazooka. The military nicknamed an antitank weapon the bazooka in World War II, due to the gun’s resembling Burns’ tuneful contraption. He also contributed to the baseball card collecting hobby when Topps Chewing Gum Company gave its new bubble gum the name Bazooka, added a comic strip, featuring Bazooka Joe in 1954. Five years later, Topps added printed color pictures of baseball players on the display boxes of its gum products, the Bazooka baseball card panels issued from 1959 through 1971. Bazooka Joe, that eye-patch wearing cartoon character, is now retired (last seen in the gum in 2012), but the Bazooka cards remain, in varying quantities, and provide collectors with an attractive and challenging parallel set to Topps regular issues of the period. Just Collect was most fortunate to find a near-complete set of 1966 Bazookas at the September 2014 “Philly Show” at Valley Forge Resort and Casino. These survivors include 15 of the 16 panels making up that year’s set, plus a graded Mickey Mantle card, which earned the SGC rating of 88. This collection is missing only two commons, card #8 Leon Wagner and card #9 Ed Kranepool. The overall condition of the rarely found intact 3-card panels is excellent. As I mentioned, the panels of cards were printed on the bottoms of the bubble gum. Placed on shelves in numerous corner stores and grocery market, without the benefit of a cellophane or other protective covering, the cards were subject to wear tear and other damage from shelf-rubbing and other rough handling in stores. How would your regular issue Topps (or other) cards from the vintage years have fared if they were subjected to sliding, rubbing, scratching along store shelves all day? When they were found, (many shop owners did not keep boxes of any product), cards would be cut off the boxes, with a wide ranging degree of sensitivity. Kids were the primary purchasers of the bubble gum and cards, of course. Kids and scissors do not necessarily equate to precision, hence the limited numbers of high grade singles, let alone panels, still out there on the market. But there are some. 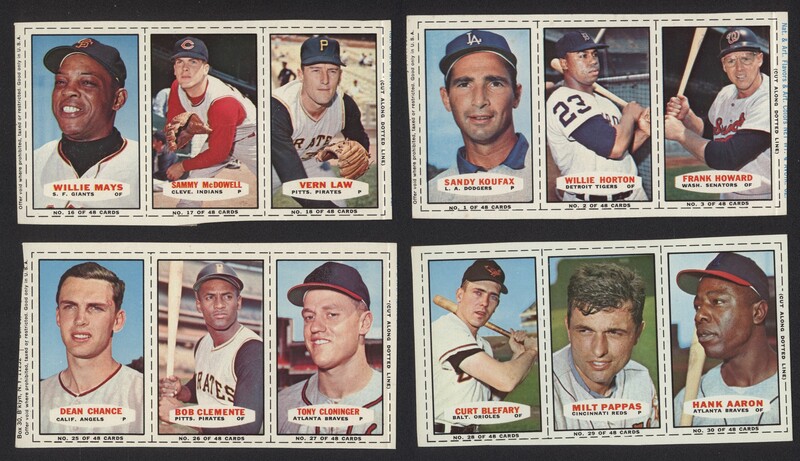 The blank backed Bazooka’s for 1966 include 18 Hall of Famers, and the cards display fabulous photography highlighted by vivid colors and contrast. Our panels all show plenty of neat, unfettered white outside the dotted black lines separating card from card. When issued, the single card measures 1-9/16 inches by 2-1/2”. Each three-card panel in as-manufactured size is 2-1/2 inches by 4-11/16 inches. The panels recently acquired measure up, and appear about as flawless and “brand-new” as 48 year old box bottoms can possibly be. Making up the 15 complete panels we obtained are Panel 1 with card #1 Sandy Koufax. This would be Sandy’s last active year in the Major Leagues. PSA’s Population Report reflects that a total of only 19 first panels have been graded there, with only fortunate collector holding a Gem Mint PSA 10. Another 8 Panel 1’s graded by PSA, however, did earn the upper ratings of 6 through 9. With sixteen Hall of Fame members spread out over 16 panels, there are only two 3-card boards missing a Cooperstown resident, Panel 2 (Richie Allen/Mel Stottlemyre/Tony Conigliaro) and Panel 15 (Pete Richert/Bert Campaneris/Jim Maloney). The Mantle card appeared on Panel #3, and the set also includes Juan Marichal AND Harmon Killebrew, while Jim Bunning and Frank Robinson are shown on Panel 11. Willie Mays, Hank Aaron, Roberto Clemente and Don Drysdale, Willie McCovey, Bob Gibson, Carl Yastrzemski, Brooks Robinson, Ron Santo and Al Kaline round out the HOFers shining in this outstanding collection. All these panels are undergoing processing for professional grading, and will be offered in our upcoming weekly auctions once the grading is completed. Going to a show always brings a good feeling of anticipation for a great buy or a great sale. I’m getting that same good vibe as I await the grades these panels should bring through this grading process. Robert, Ken and Bob Burns, three artists. The incredible condition of the 1966 Bazooka Baseball panels picked up at Philadelphia, the tremendous sports art they represent, these pictures… they paint a thousand words for that poet, for a documentary film of their own, and all because an Arkansas musician gave us the name “Bazooka”. These box bottoms surely at or near the top of Bazooka panels surviving all that “shelf-running"!